She Decided To Eat Nothing But Bananas For 12 Days. These Are The Results Of Her Experiment! Sole nutrition is not highly recommended, but with good prior preparation you may notice positive changes. 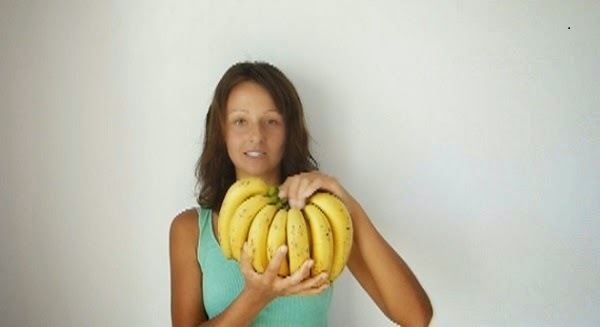 Julia Tarbes is a nutritionist and a motivational coach who decided to eat only bananas for 12 days in order cleanse her body. Bananas are a high quality fruit which although caloric contains fructose, sucrose and glucose, and fiber, and it is this combination creates a feeling of fullness that lasts longer. The first thing she noticed as a change was the stomach relief and the silent digestion. – I had a feeling that I have no stomach, because my intestines were very calm. Also, I noticed that I was very loose, felt no stress, and I was more creative and more concentrated – says Julia. – For the first time in my life only a day was enough to finish all my obligations. I wasn’t tense and I could focus on any task. Her husband Paul joined her in the experiment. With the fact that both are vegans for a long time, they have their own fruit garden, so it wasn’t very difficult for them to prepare meals. Before the changes in her diet, Julia suffered from high blood sugar levels, digestive problems, candida, depression, hormonal imbalance, and couldn’t stay pregnant for many years. After making a radical change and going vegan, her health improved, and gave birth to a child. She had a full life twist. However, you must be very careful before you engage in such a drastic food change. All people can’t submit it equally or it can’t be done with any fruit. For those who have problems with the thyroid gland, this can be counterproductive, reducing its work, and you may have a lack of vitamin B12, iron, zinc and calcium, which leads to anemia. This diet is not recommended for the elderly, pregnant women and children. But in any case, before embarking on a radical change in diet, it is best to inform your doctor and nutritionist.